Closure of two underperforming stores to lift profitability in FY17/18e. Both Woodlands Blk 6A and The Verge stores have to make way for government’s redevelopment projects. Despite being profitable, both the stores have been adversely affected by the exodus of residents and neighbouring stores. While we will see the full impact of the two store closures in FY18e sales, operating margin should steady at the current 10% level as we expect store productivity to improve by c.11%, from S$1.8k psf (per square feet) to S$2k psf. Rent saved from closure of The Verge and Bedok Blk 209 store, which is now self-owned, also contributed to the lower operating expenses. One-off refund of prior years’ taxes amounting to $2.2m boosted net profit, and will be distributed back to shareholders via dividends. No change in dividend payout guidance at c.70% of earnings. Competition remains keen with influx of online retailers; Brick-and-mortar competitors are also driving fresh penetration. The Group’s effort to strengthen its fresh product offerings has been matched by NTUC Fairprice. Gross margin to sustain at 26.0%/26.2% in FY17/18e on efficiency gains derived from the central distribution centre and favourable input prices. Management shared that it is still a buyer’s market for groceries. New stores continue to drive FY18e growth. 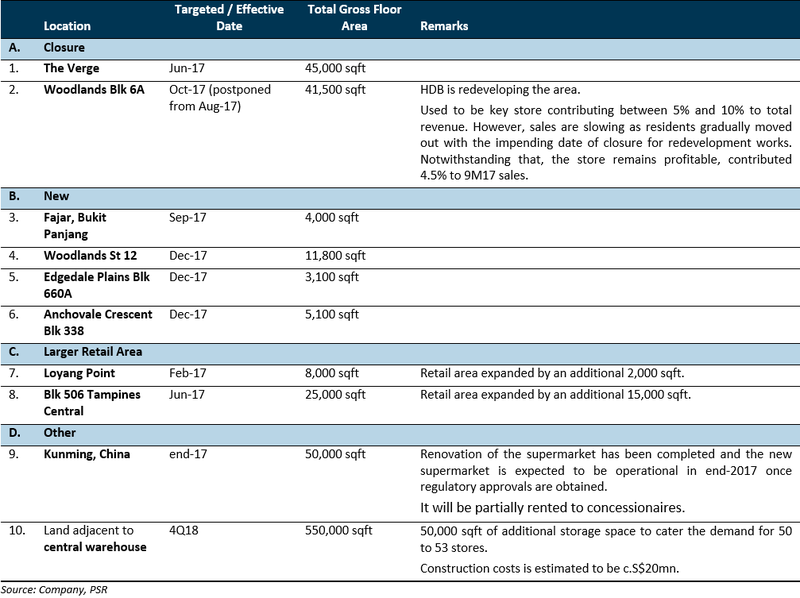 Three new HDB stores gained from the recent bidding exercise (see Figure 2) would partially mitigate the closure of two big stores. Including the expanded Loyang and Tampines stores, as well as the new Fajar Road store (opened in Aug-17), retail area -0.9% YoY by end-FY17. We expect the four new stores opened in 2017 coupled with the improving consumer’s sentiment to lift FY18e Revenue and PATMI by 5% and 6.9% respectively. Healthy pipeline of new stores up for bidding in the next 6 months. There are 10 new supermarkets units pending completion by Mar-18 and 18 more in 2Q2018 to 4Q2021, according to data on HDB HBiz website. 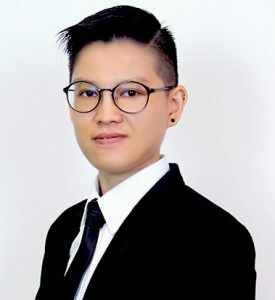 However, management shared its concern on the proximity of these locations with existing stores, which include those under Sheng Siong’s brand. Net cash position of S$64.5mn with zero debt as at end Sep-17 to support CapEx. We adjusted our FY17/18 CapEx (capital expenditure) as the earmarked CapEx for the construction of central warehouse has been deferred into FY18. We expect FY18 CapEx to be around $31mn, including S$20mn from Warehouse, and the remaining being new stores’ fitting costs and maintenance CapEx. Upgrade to ‘Buy’ rating with higher TP at S$1.13 (previously S$1.06), as we roll forward to FY18e. Our TP is based on an upgraded estimated 4.93 cents FY18e EPS and 23x PE multiple. We adjusted FY18e PATMI 1.6% upwards on better operating margin. We kept dividend payout for FY18e to c.70%, which gives an implied dividend yield of 3.5%. Re-rating catalysts: (i) Successful bidding of new stores; and (ii) Improvement of product mix.